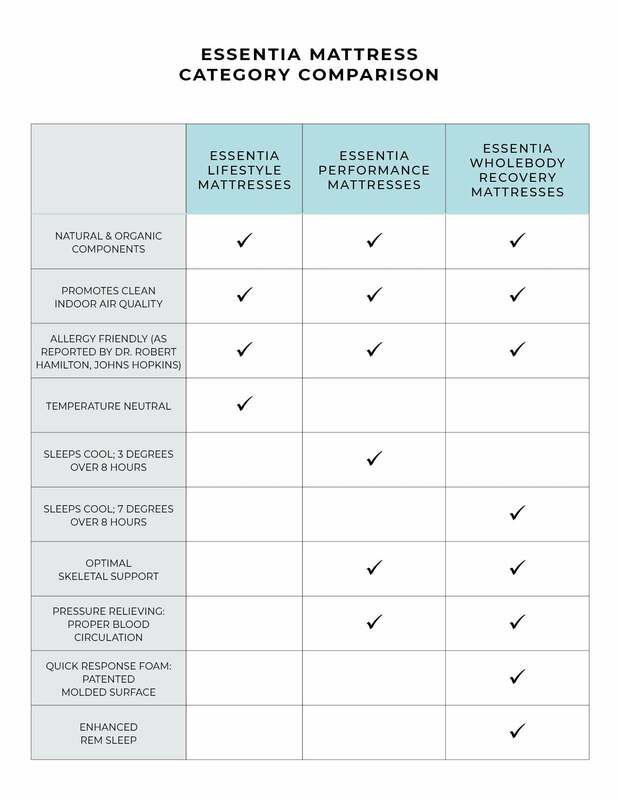 ProCor Custom Mattress | Organic Essentia Mattress Inc. Packed with Essentia technology and featuring all 6 key elements for whole body recovery including a faster response time to reduce sleep interruptions and promoting ‘micro-hibernation’ by sleeping on average 7 degrees cooler than your body temperature. The ProCor custom mattress nurtures the body allowing it to heal and recalibrate from a grueling day. Essentia’s patented molding technology creates a mattress that outperforms anything on the market, when paired with the ability to custom fit your body’s needs, sleeping on a ProCor makes you unstoppable. To learn about the incredible benefits of a custom recovery mattress, visit our Athletes page. Comfort layer featuring Essentia’s patented natural memory foam is built based on the results of your personality test which determines where you carry the most of your muscle tension and what areas of the body need the most pressure relief. This will determine how many layers and formulas of foam are needed for your ProCor. Your ProCor Custom mattress is built with the help of artificial intelligence in the form of Essentia ID. Developed and implemented with research from renowned professional sports psychologists and osteopaths, the ID evaluation uncovers your physical strengths and weaknesses by identifying your personality type, musculoskeletal type, the sport played, muscular tensions, and weaknesses. The resulting information is key to the build of your custom ProCor. The support core of your ProCor is designed to support you based on your height, weight and where you carry most of your muscle and weight. This allows us to build the core with additional support in areas where it may be needed, for example, hockey players tend to carry a lot of weight and muscles in their legs and thighs so that mattress will be built with additional support in that region to ensure proper posture support and spinal alignment.